Don’t you hate it when a food you think is healthy turns out to be a total ripoff in the nutritional department? Like when a taco salad has two sprigs of lettuce in it and has an entire day’s worth of calories in it? Or when what you think is a modest dessert turns out to have as many grams of fat as a Whopper? Tricky foods are out there, but today’s post shares a few imposters to skip—courtesy of the authors of The Healthy Home! 1. Breakfast cereal. Cocoa crisps and fruity-O’s aren’t healthy. That may be a given. But what about that “healthy” cereal you buy? You know, the one your kids won’t touch? 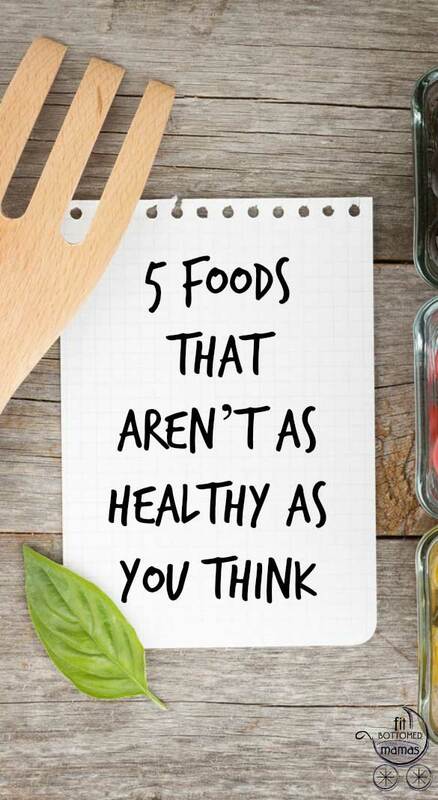 It may not be as healthy as you think. Sure, it contains some fiber, which is good for your heart. Yet the processing required to make that cereal can often strip it of valuable nutrients and decrease the time it takes to break down in your body. The result: A spike in your blood sugar levels followed by a crash a few hours later. Dramatic surges and drops in your blood sugar leave you feeling hungry sooner—which can lead to unhealthy mid-morning snacking—and can also increase your risk of insulin insensitivity, obesity and eventually adult-onset diabetes. Cereal may be quick and convenient, but it’s not your only option in the mornings. Try eating fresh fruit, scrambled egg whites or grains in a non-flour form like steel-cut oatmeal. These options are healthier, just as quick and will leave you feeling full for a longer period of time. 2. Fast-food salads. Many people looking for healthier choices opt for salads when they go out to eat. But salads aren’t always as healthy as you think—they come loaded with hidden fats and calories, and in many cases, you may be better off just ordering a burger. Meanwhile, Wendy’s quarter-pound single hamburger has 470 calories and 21 grams of fat. This doesn’t mean you should give up on salads entirely, but you need to be aware of the hidden dangers many salads contain, including croutons, creamy salad dressings, and add-ons like bacon, fried chicken, tortilla strips and guacamole. Skip the croutons. They’re usually deep fried. Get oil- or vinegar-based dressings, not creamy dressings. Creamy dressings like ranch are loaded with fat. Get the dressing on the side. You won’t use as much that way. Avoid bacon, fried chicken and tortilla strips. Best of all, you can make your own salad and take it to work with you. If you’re already making a conscious choice to eat healthy, then why not take it one step further and make your own salads at home the night before? That way, you know exactly what you’re eating. 3. Canned soup. Your mother always said that soup was good for you, right? Well, that may be the case with homemade soup. But the can of condensed soup you had for lunch may be raising your blood pressure and causing inflammation. Condensed, canned soup is filled with sodium, which can be detrimental to your health if you consume too much. For instance, just one cup of condensed soup—with maybe a single serving of vegetables—can contain more than 1,700 milligrams of salt. That’s the sodium equivalent of five large orders of McDonald’s fries! Don’t give up hope, though. There’s still a way for you to have your soup and eat it, too. Try making a pot of homemade soup. Not only is it a heartier and much healthier option than condensed soup, but you can also add as many vegetables, beans or meat as you want. Plus, homemade soup freezes really well, so you can make a pot on the weekend and then eat it during the week. 4. Fruit juice. Sure, fruit juice is full of vitamins, but do you know how much sugar it contains? Even products labeled as “100 percent juice,” or “no added sugar,” may have more sugar than a can of soda. Why? Because the fruits themselves are full of sugar. The important distinction between the two is that fruit contains fiber, whereas most juices have little to no fiber content. The fiber found in a whole apple, for example, plays an important role in helping your body metabolize the apple’s sugar. And the pulp from a whole orange contains important flavonoids that are lacking in most orange juices. What’s even worse are the “juice cocktails” or “juice drinks” marketed to kids that contain high-fructose corn syrup. Some of these so-called “juice” beverages contain very little actual fruit juice in them at all, making them little more than colorful boxes filled with sugar and water. To get the most life-giving nutrients and the healthiest source of sugar from your apple a day, opt to eat it rather than drink it. 5. Yogurt. Yogurt is a prime example of a healthy food that is often ruined by manufacturers. While on the surface it appears to be a healthy option, the reality is that many varieties of yogurt have been saturated with artificial colors and sweeteners, and some are even loaded with trans fat. Fruit-on-the-bottom varieties are among the worst of the yogurt impostors, since they often contain fruit-juice concentrate, not real fruit. This means they’re full of sugar and counteract any benefits the actual yogurt may have to offer. While pre-mixed yogurt is a better choice, it still contains artificial colors and flavors, and unhealthy mix-ins like processed granola can add to the damage. When it comes to yogurt, the healthiest option is simple—just stick with plain, unflavored yogurt. That doesn’t mean you have to sacrifice taste for health: Try adding fresh fruit or other healthy mix-ins. It’s perfectly acceptable to enjoy your favorite flavor of yogurt—just be sure to add the flavor yourself! © 2011 Dr. Myron Wentz and Dave Wentz, authors of The Healthy Home: Simple Truths to Protect Your Family From Hidden Household Dangers. I was just reading about how lots of fruits themselves can be harmful to your waistline – it’s not just juice! High-fructose fruits like cherries can cause your blood sugar levels to spike. It’s a shame too – they’re my favorite for summer. Guess I’ll have to stick to a handful, and no more. Anyway – I stumbled on this great Huff. Post article this morning. Thought you might be interested, since it reveals calorie secrets of other seemingly harmless menu items. Behold the fattening powers of spinach artichoke dip! Fruit is natural sugar, and is good for you. Fruit.juice is usually processed and not natural. Havent you heard of the high fruit diet? Watch freeleethebananagirl videos on youtube. I eat Mini-Wheats everyday for breakfast with black coffee and I do not have any of the symptoms listed. I know a few diabetics that can not eat specific fruits because it makes their insulin spike. Everything we eat is processed , unless you get it from your backyard….well, depending on where you get your seeds, those can be processed too.